To do this click the Files tab, browse for your files and click upload. 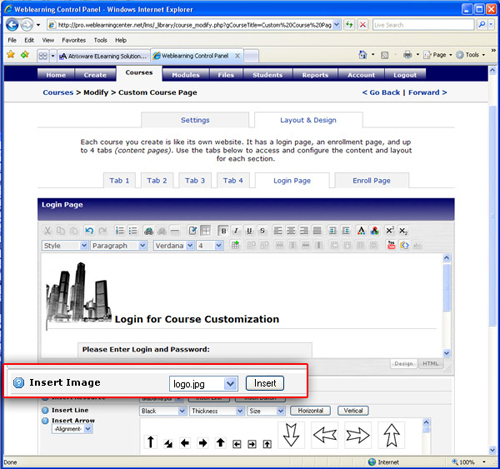 Now that we have some files to work with, click on the Courses tab and click “create a new course.” Give your course a name and click Add Course. Now that we have a course created, we want to add a student to the course. 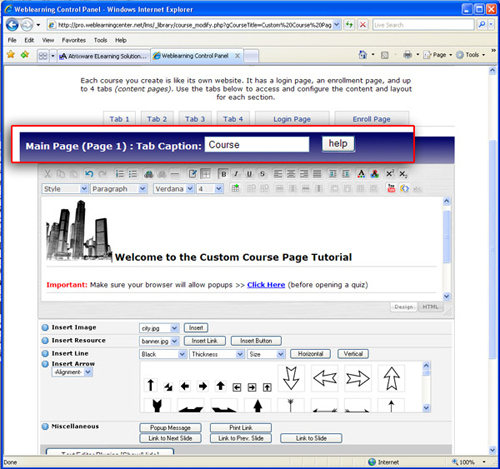 Click Courses > Admin Tools > Student Enrollments > Add Student. Fill in the required fields and click Add Student. Now you want to create or add a quiz to course. After your quiz is created, click the Courses tab then “admin tools“ for the course we are working with. Click the Modules (Add/Remove) tab. 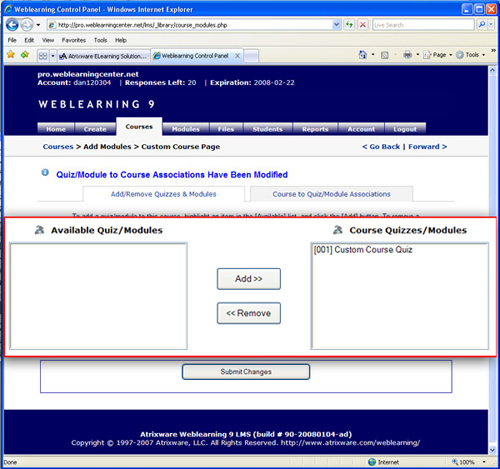 Then select the quiz you would like to add to the course, click the Add button then Submit Changes. 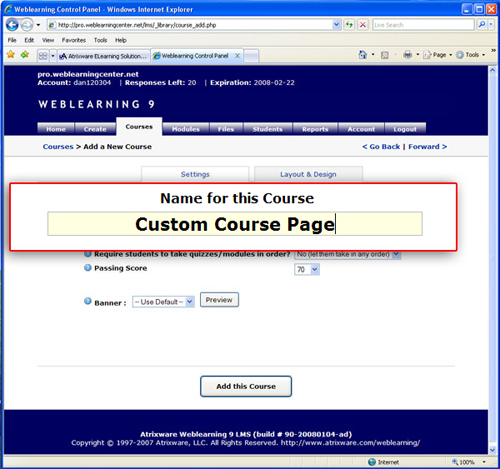 Now that your course is set up with a student and a quiz, we will begin customization. 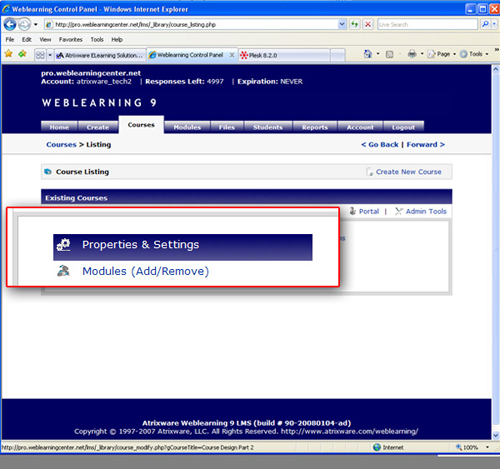 Start by clicking Courses > Admin Tools > Properties and Settings of your selected course. Now click the Layout & Design tab and select Login Page. The first thing that we will change is the header text. Click in the editor and type whatever you would like for the login header. If you look at the editor tools, you can change the font, make a list, table, link etc. I would recommend you to try out some of these options and see what would work best for your design. If you would like to add or change an image, simply click in the editor where you would like the image to be displayed and click the Text Editor Plugins button. This will display a list of available options but for now we will just stick with inputting a custom image we uploaded earlier. Click the Insert Image drop down box and select an image that you uploaded. It will then display in the editor then click Submit Changes. Note: You can also insert resources such as pdf files, links to a website, lines etc. Now that you have customized your Login Page, you can do the same with any of the other tabs. The fourth tab is a custom tab that you can add if desired. 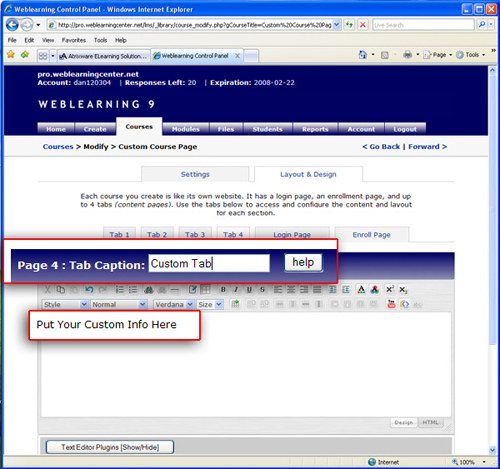 Note: If you do not want to display a tab, simply remove the Tab Caption at the top of each page. 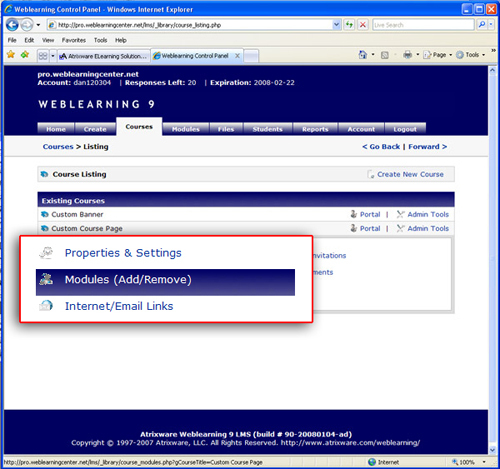 This will tell the Weblearning system to remove the tab without the need of removing everything in the editor below. 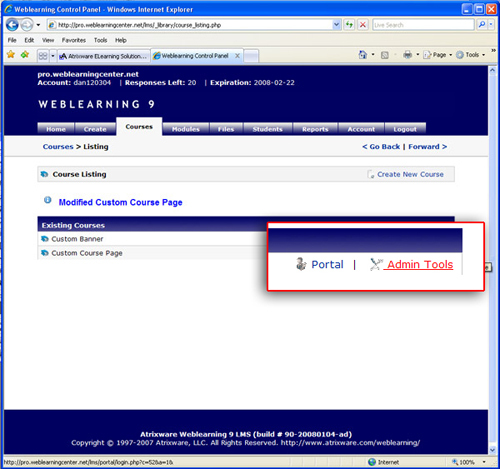 This entry was posted on Monday, February 25th, 2008 at 11:07 am	and is filed under Atrixware 101, Dan, Weblearning. Both comments and pings are currently closed.